Material: Children's playground, digger, bucket and small balls. Using a sand pit digger truck little balls must be dug out of the sand and poured into a bucket. 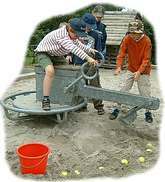 These diggers can be found on many playgrounds and can be used for a station game. Obviously larger diggers would also be possible. One person sits on the digger and tries to grab the balls. A second person pushes the digger through the sandpit to the bucket or spreads the balls throughout the sandpit. The number of balls dug up and put in the bucket within the given time (2 minutes) are counted.